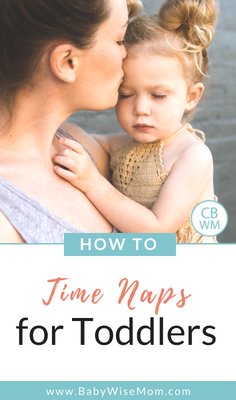 How to time naps for toddlers. What time is the best time for toddlers to start nap time. 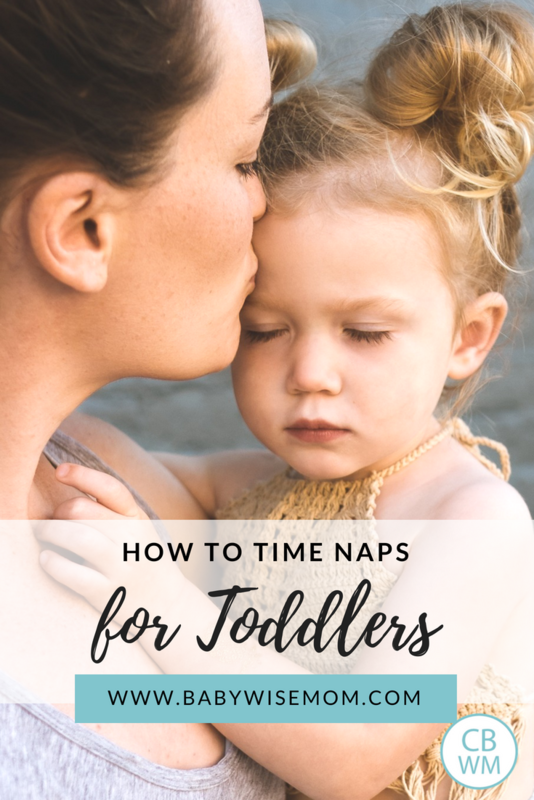 As your child moves into toddlerhood, she will most likely move away from “X hours of waketime” before naps and more toward “this time is naptime every day.” I am sure that sounds confusing, so I will elaborate. While she is an infant, your baby really needs X number of minutes of waketime (see The Cornerstone for Good Naps for more). For some babies, one minute can make the difference between a good and bad nap. If she needs 55 minutes of waketime, you need to get her back down for her next nap within 55 minutes of waking. As she gets older, the exact number of minutes softens a bit. There is more of a window of time rather than an exact number of minutes. 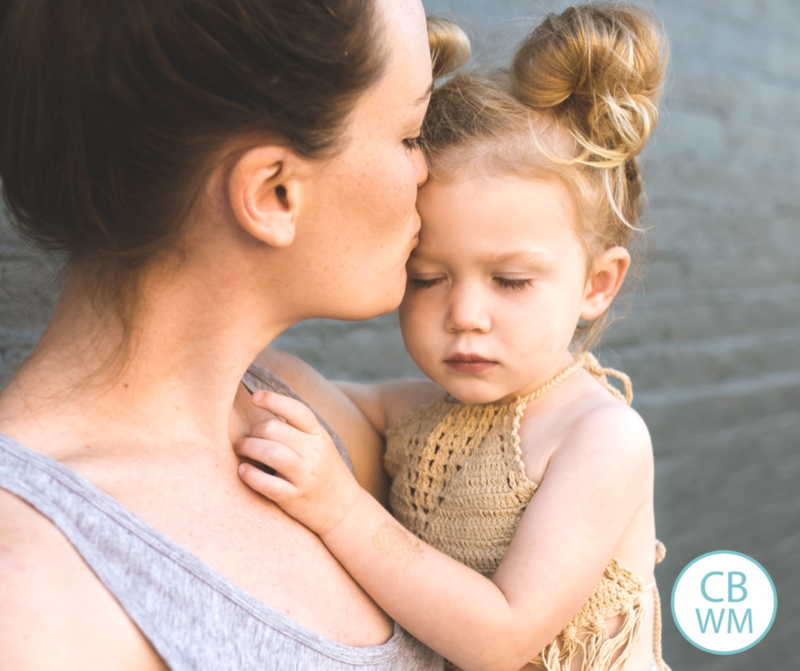 As she moves into toddlerhood, it gets even easier for mom. Most toddlers will then just have their naptimes that are set with little variation. Let’s say your child’s morning waketime is usually 7:30 AM, followed by a morning nap at 9:45. One day she wakes up at 7 AM instead for whatever reason. Most toddlers can still go to bed at 9:45 and take a normal nap. Some will need to go down 5-15 minutes early and still take a normal nap. Very few would need to go down at 9:15 to make up for those 30 minutes (though if your child is that way, go with it. Don’t try to force her to stay up too long just because most other kids aren’t that way). While your toddler is flexible in this way, be sure to note that timing still plays an important role. For example, Brayden’s naptime is 1 PM. If I get him down anywhere from 12:50-1:05, then he will go right to bed. If, however, I get him down 1:10 or later, he will usually play for a while before finally going to sleep because he will have caught his second wind by then. And in case you are wondering, 1:05-1:10 is a guessing game. Sometimes it is okay, sometimes it is not. Read more about optimal waketime length for toddlers here. Be aware of this ability as your child gets older and find the right move for her. It is nice to have more flexibility as they get older. That is what Babywise is all about. You put in a lot of work in the beginning, but it makes it so there is less work in the future and just more overall enjoyment. Tanya, This is pretty normal. It can be stressful when the first start to do that, but it is normal. I didn’t move my son’s nap any later until after he was 3. You can try it, but at that age (27 months) I found it imperative he got in bed right on time. As important as a newborn. If he was 5 minutes late, he wouldn’t sleep. Be sure you are getting her down in time–but you might have to experiment to see what that is. Previous Post Potty Training Success! My daughter takes 3 naps now. When she wakes early from a nap she definitely needs to lay down early. She just gets too tired and can’t make it to the normal time. However, she doesn’t always make up for lost sleep and will still wake up 1.5-2hrs later. Would you do an extra feeding, wait until she usually eats if she isn’t acting hungry, do an extra nap for that day…? Sorry for so many questions. I feel like I’m asking for your advice every day!Also, I’m kind of curious as to when people introduced solids/rice cereal to their baby. Do you think you could do a poll on that? No worries on the questions :)That is a great idea for a poll; I will start that one tomorrow after the current one is closed. For the napping, I can’t remember her exact age. But here is what I would do at most any age. I would try to get one of the cycles to go longer. If that didn’t work, I would most likely do an early bedtime.If she gets really ahead of schedule, I would work an extra feeding in there, or maybe a short 20 minute power nap at the end of the day to get her through to the last feeding. There are a lot of options. Try them out and see what works best for her and your family. My quads are 9 months (7 months adjusted) and they still can only go about 2 hours of awake time unless we are out and about doing something new and exciting. I’m glad to hear this will soften with age and it just reaffirms that this is more of a stage than me not doing something I should to be sure that they can stay awake longer in the afternoons, especially. They are still sleeping through the night (7p – 6 a) so life is good. Thanks for the post! Two questions, one dealing with this post and one unrelated: 1. For timing naps – at what age generally can the nap just be at a certain time and not after “2 hours waketime” for example. My 7 month old needs to go down after 2 hours, regardless. Is that just something I’ll have to feel out with him?2. Regarding night waking – he was sleeping 10-11 hours at night and just in the last few weeks started waking after 6 or 7 hours. Sometimes he’s ravenously hungry and sometimes he’s not, but he’ll eat. He doesn’t seem to be in pain or anything – just wide awake. I would be all for CIO if he could settle himself in a reasonable amount of time, but the few times we’ve done it – he’s cried for over 1.5 hours. And we’ve caved and patted him (not picked him up) to sleep. We just need some encouragement. Since clearly we don’t have a baby that will cry 15-20 minutes and be done at night. How long do you let them cry during CIO? First of all I wanted to thank you for your advice several weeks ago when I had questions about naps and nighttime sleep with my almost-8-month old. The past few weeks he has been sleeping great with no real issues! !I have a question unrelated to this post. William has never been a long nurser, and his feedings are getting shorter. His bedtime feeding is usually 5 minutes or more, but his other 3-4 feedings are often only 2-3 minutes. I say 3 OR 4 because I try to breastfeed him after his afternoon nap, and sometimes he will nurse, but other times he refuses to. He has breastmilk and solids about 7:15 a.m., 11:15-11:30a.m., then I offer to nurse him after his nap, around 3 p.m., then nurse and solids again about 5 p.m., then nurse at 7 for bed. He nurses well at 7 even though he eats a big dinner at 5. Any advice? I wonder if he is ready to start weaning, but I have nothing to wean him to at this point, since he has never taken a bottle (I really tried for a while) and does not yet do well with a sippy. I don’t know if I should be concerned about the amt. of milk he is getting, or about my milk supply, or just “roll with it.” And advice is appreciated! Sorry for the long question. Noelle….My daughter will be 8 months old this weekend and I’ve been dealing with the same issues. A week or two ago I decided after one of her VERY short nursings to try a bottle just to see what she would do. She GULPED down 4 more ounces! So…??? It had been probably four months since she’d had a bottle, but she took it. I had really been praying about when/how to wean her, but it seems that she’s doing it herself. I have no other advice other than my personal situation, which may be very different from what your William needs. Good luck! Courtney,1. In my experience, it is really closer to a year that they start to have more of a set naptime rather than set waketime length.2.I would recommend this post: 5-8 Month Sleep Disruptions : http://babywisemom.blogspot.com/2008/05/6-month-sleep-disruptions.htmlExplore the explanations in that post first. Good luck! Noelle,That is pretty normal. My daughter nursed very quickly. I wouldn’t start to wean from that. See this post:Nursing Woes : http://babywisemom.blogspot.com/2008/03/nursing-woes.htmlHe might be ready for only 4 nursings instead of 5, if you think your supply will be fine with 4. Oh, and you are welcome–I am glad things got better! Heather,That is a good point–you should always consider supply. If your baby is satisfied with short nursing, then he is probably just fast, but if he isn’t satisfied and wants more food, then it might be supply. Hi, I first want to say thank you for your blog!! In my circle of mommies, none of them are using BW principles, so this is so nice to be able to get feedback from you. Our only child, Ellie, is almost 17 months old and we have used BW her whole life. Ellie is showing signs of needing to dropping her morning nap to just one nap. My question is on how to drop the am nap. Do I shorten her morning nap by 15 minutes and then put her down 15 minutes earlier for her afternoon nap, doing this for 3-4 days and then shorten again? I think that’s how we dropped her 3rd nap – but I can’t quite remember. Again thank you for you time!! Things have been pretty interesting with Isabella lately now that we are finally moved and she is now sleeping a real crib. She is now sleeping till 7 am, to where as before she was waking between 6 & 7. This morning she slept till 7:20, I didn’t wake her at 7 to see if she is going to start sleeping longer. Her am napped this morning was basically nonexistent. I put her down at 9, I normally put her down at 8:45 and she did not fall asleep. I kept her in the crib till 11:30. I got her up gave her lunch and put her down at 12:30. She was asleep at 12:40 and only slept till 1:40 (Now that she is sleeping in a real crib she has been napping 2 to 2 1/2 hours). She woke early in afternoon due to a phone call this afternoon. I tried to put her down later for another nap, because I felt that she would not be able to make it till her bed time however she did not sleep. So I am not too sure if I should change her wake time to 7:30 or keep it at 7:00. I would like it to be 7:30 if she is able to sleep that long, but I don’t want her am nap to be messed up. Any advice will be helpful. I have no idea what to do. Today she napped for an hour in the am, for 10 to 11:00. She woke at 7 am. I have been trying to put her down since 1 pm and it is going on 3:22 and she is still not asleep. I am hoping to get some feedback on my son’s sleeping schedule. He is currently 21 months (2 in November). His bedtime is 7:30pm to 7:30am and we’re consistent with it. The problem is that he’s having a hard time falling asleep at night. He’ll lay awake talking to himself…sometimes for up to 1 1/2 – 2 hours. He takes his nap at 12:30 and we only let him sleep 2 1/2 hours (he was sleeping longer but then it was really difficult for him to get to sleep at night). He’s a typical, very active boy so I’m confident he’s getting a lot of activity during the day to “wear him out.” This has been going on for weeks and I just feel bad for him just laying in there, even though he’s “happy” about it. Is 2 1/2 hours a typical nap length for his age? Should we shorten it or push back his bedtime? I think that is a typical length. You can try to shorten it to see if night gets better if you want, but it sounds good to me. You could try tweaking your bedtime routine? Hi Plowmanators, question regarding toddler naps – my son is a 2.5 year old Sanguine temperament and he’s always been a great napper. But in the past month he has been taking a LONG time to fall asleep for his nap. Prior to this, his typical naptime was 12:30 PM and he would take about 10-20 min to fall asleep for a 2-3 hour nap. But lately its taking him 45 min minimum and sometimes 1.5 hours to fall asleep! If he does fall asleep at all – there are days (mostly weekends) when he doesnt go to sleep at all, just hangs out in his crib and talks to himself for 2+ hours. When he does fall asleep, he usually takes a decent nap so I really dont think its time to drop his nap entirely. (Note: there have been no changes in routine in our home)Sometimes we find him with a poopy diaper, but that is almost never in the first 30 min of laying there awake, its more like the days when he’s up there talking to himself for 1+ hours that he works out a poop. So I dont think thats the cause of wakefulness?? ?We’ve tried going up to his room and shushing him and telling him to lay down and be quiet. We tried moving his naptime earlier – like sticking very close to 12:30 – that didnt make a difference. Then I’ve moved it the past 2 weeks or so back to 1:30 PM. That seemed to be working for a few days, but didnt work over the past weekend. I know he is high energy and I try to give him chances to get tired and run around in the first 1/2 of the day, but it seems ridiculous and frustrating to me to have to run a marathon with him in order to make him tired enough for a good nap. And plus tiredness didnt seem to be a problem earlier this year?? ?FYI the AM routine is 7:30 AM wake, eat, music time with mom, blanket time, book time with mom, room time, outing (park or the gym play room) and errands, then home for lunch and 30 min of Blues Clues to wind down before nap at 130 PM. Nighttime sleep has always been good and still is, with bedtime at 8 PM. Advice? I would guess he needs a later nap. I would try 1 PM for a while. 1:30 is most likely too late.Also, he is now at the age where thy often go for spurts of no nap. If he is pleasant enough in the evening, I wouldn’t stress about it too much. My son will have a few days where he doesn’t nap, then sleeps like a champ for a couple of weeks. He might need a little earlier bedtime on days he doesn’t nap. My son is 13 months old and has been really random with his naps the last few weeks. More days than not, he has only been going down for one nap, usually the morning. He will play in his crib for his entire afternoon nap sometimes. It also seems like it is taking longer for him to fall asleep, if he does. Sometimes it takes 30-45 minutes and then that seems to screw up the afternoon nap. If he does not go down for his afternoon nap before 2:30 I might as well forget it. Is this just a phase or is he already ready to drop a nap???? My daughter is 22 months old and has been not napping some days since she was 21 months old. After reading other comments, I see this is a normal process, but the children are older like 2.5 to 3 years old. Is this normal for a child her age? I have shortened her nap time to 2 hours instead of 3 and that has helped some. Any suggestions are welcome. Our schedule is wake at 7:30 to 7:45, reading for nap 1:30, down for nap at 1:50, up from nap at 4 to 4:15, bedtime is 8:30. Thanks! teach, have you tried having naptime earlier? My kids go down at 1 PM, which I think is about as late as most kids go down for the afternoon nap. She might nap better if the nap was earlier. She might be overly tired when naptime finally comes. I did try the earlier time, and she napped for a couple of days and then did not for about 3. So, I moved her naptime later (around 3pm) and she has napped better. She will still not have a nap some days, but really needs one when evening rolls around. Thanks for the suggestion. This is a difficult phase. Should I just move her to quiet time instead of nap even though she is still in a crib? I would just put her down at nap time. If she sleeps, great. If not, at least she had quiet time. If she doesn't fall asleep after X amount of time (X determined by you), then get her up. You might need an earlier bedtime those days. Thanks! Sounds like a good plan. My son just turned a year old and he has been a babywise baby since he was 2 months old. Although naps have sometimes been challenging for us (i.e. chronic 45 min), they have seemed to work themselves out now that he's on a 2 nap a day schedule. Approx schedule: 630 wake up; 830 – 10am nap; 1 – 3 pm nap. Bed at 7pm. He has always been very easy to put down at night (usually not a peep and excited to go to sleep). All of a sudden that changed. I don't know if it's because he's really not tired at 7pm or if it's because of his new "abilities" i.e. pulling himself up in crib etc. Has anyone else gone through this??! I don't know if I need to let him CIO at his 7ish bedtime or put him to bed later? Mich, if all that changed is that he is upset at going to bed, it is probably just that he is upset becaue he wants to stay up and play. If waketime length recently changed or naps shortened in the day, he might need an earlier bedtime.If you decide to put him down later, go in no more than 10 minute increments. How did you figure out what time was the magic window for Brayden down for his nap? I'm struggling with timing my 20 month old's nap. It is consistently only 1.5 hours and noting her afternoon behavior, I know that is not long enough. I've played with starting at different times without any success yet. Jennifer, I just picked a time. I choose 1. The -wise books say it happens sometime after lunch, so I thought one was good.I then noticed that if he went down after 1:10 his nap wasn't as good.So I would shoot for one, then move back if naps aren't at least 2 hours. I have a few questions in response to your last answer to Jennifer.What time was Brayden's wake time? And when you said "move back if naps aren't at least 2 hrs", do you mean move back, like earlier (12:30) or do you mean move later (like 1:30)?My son is 14 months, and he is normally awake from 7:30-1:30. I start his nap 'routine' around 1:30, and by 2, he is asleep. His naps used to be almost 3 hrs, but they've been all over the map for the past few days. One day it was only 30 minutes! Another, it was only 1.5 hrs… I really can't seem to figure out what is causing this disruption. One day I tried putting him down sooner (@ 1 pm), but he was awake @ 3. He started waking up in the middle of the night, too, but generally falls back asleep within 5 minutes…Do you think it could be teething?? Does anything else usually happen around this age? Maybe an ear infection? My daughter is 13months 2 weeks now and she sleeps from 8pm to 6.30am and 2 naps (10-10.30am and 12.30-2.30pm). These days it is more difficult to get her sleep especially nap times. She cries whenever being put in the crib even not for naps. I have tried CIO but it didn't work and she hated the crib. What can I do ? My son, 21 months, is a BW success story. We've never had any problems. That is, until last week when he started waking up 40 minutes into his nap screaming. He falls asleep with no trouble, but wakes too soon in total hysteria. He doesn't seem to be teething and wakes with a clean diaper. We've employed CIO for over a week now and seen no change in behavior. Can you suggest possible causes. The problem does not present at bedtime. His daily schedule is up at 8:30, nap at 1:30, bed at 7:00. Tam,Without allowing her to cry, I would suggest you check into The Baby Whisperer Solves All Your Problems or The Baby Whisperer For Toddlers. She will have non-CIO advice. Also, be sure her length of time awake is appropriate. If it is both too long or too short, she will cry and have a harder time falling asleep. Melissa, is he verbal enough to talk to about it? I would have to wonder if he is having bad dreams, though it would be strange to have that at naps and not night, I don't think it would be impossible. If you like, I can pose this as a help a reader out question. There might be people out there who have experienced something similar. Let me know if you would like me to do that. Please do pose it as a help a reader out question. Bad dreams are a possibility, but he's still not speaking, so it's hard to know. My other thought is to try moving his nap up a bit, but it's already pretty early in the day. As a side note, the new behavior did start about 5 weeks after the birth of our second son.Thanks! Valarie,I am a very frustrated mama right now! Like Melissa, I have a BW success story of a toddler. We have used the philosophy since she was 6 weeks old. She is 18 months and 1 week now. For the last month she has been either not sleeping at all during her one nap (from 12:30-3:00). Not one thing has changed. Our schedule remains the same. It always has. She eats well, drinks well, has a clean diaper, cool/warm enough room and of course has her favorite blanket to sleep with. We have her music going softly for her (something we have always had). I just feel like I have worked too hard for it to be like this. She has been on 1 nap since 14 months and really did very well from the transition until now. I am desperate for suggestions on tweaking anything I need too. She has been walking since a little over a year…and has been adding words to her vocabulary lately, so could that be the culprit? Is it possible that this past month has just been a phase and that things will get back to normal? !Everything else she has done up until this point has been by the book, so you can imagine my confusion with what has been going on.Thanks for any help you can offer! It is possible it is a phase.I would normally wonder if summer disruptions are getting to her (staying out late, missing naps) but since you said nothing has changed, that removes that.I would try seeing if putting her down later works. Most children her age taking one nap go down at 1 PM. I would try putting her down 10 minutes later, if that doesn't work try 10 later etc until you get to 1 PM. Okay, I need some other people's advice. My 21 month old twins (babywise babies from the beginning) have been great sleepers. once we discovered 12:30 was a good nap time for their one nap, everything was great. then all of a sudden they have been not going to sleep at 12:30. we didn't change anything about their routine. one week, they were laying right down for nap and going right to sleep. now they are jumping on their beds and taking up to 30 minutes to go to sleep. should i try to move their nap time back slowly? nap lengths have been shorter, of course. any tips or insight? thanks! Lory, this happens for most kids at some point. They usually fix themselves. But do look into what she is eating when–you might be able to impact her pooping time by eating different foods at different times. Also, does she have independent play? If not, work that into her morning because most kids will poop then. When she wakes early and is happy, I would leave her until the time you want her to get up. Laying in bed is more restful than running around and playing. Jenny, keep in mind that the time for the nap will change as they get older. They might be ready for a 1:00 nap instead. They also might be at the two year old developmental stage of bad naps and sleep. In that case, you just have to wait it out. Hi Val, Do you have a poll/could you possibly do a poll on naptime lenghths once a child is on one nap a day? JuliaAtherton,I agree that she isn't getting the sleep she needs since she is crying when she gets up. I think I would go in and tell her it is still time to sleep and that she needs to go back to sleep. Maybe even do your nap routine over again.With teething, I would give her some motrin before nap so the pain doesn't get her. Hi! My daughter is 22 months old today. In the last 2 weeks her naptime has been forcefully altered because we have started preschool. I teach and she is in the 1 year old class. Before preschool her nap was about 12:30/12:45 just depending on what time she woke up that morning. She's never been one to take to a set nap time. So that has worked for us. Since starting preschool her naps have had to become different depending on the day. I tried preparing her before preschool started, but it just messed her all up. So now the situation is Tuesday-Thursday she naps about 2 (right when we get home) until about 3:30/4. Bedtime stays at 7:45, but on days she doesn't have school Friday-Monday she will lay down her usual time. The past few days she has started to resist naps and bedtime. A new cry has developed and its like her feelings are hurt. She's a very well tempered child has always had days where she didn't want to nap because of one reason or another. However, now its becoming more constant and consistent with each nap/bedtime. How should I handle it? I've tried letting her cry it out, but I really feel like going in there and explaining it to her helps, but then some days that makes it worse. I don't want her to become this ill baby that is just in a bad mood, which I am afraid this will turn into. Should i jusr keep at my normal schedule and see if it will iron itself out after she adjusts? If so, what do I do for the time being? It's to the point where it takes her over an hour to go to sleep. Or like today, no nap at all (but its a Sunday and I've always chunked what happens on Sunday out the window bc of church and whatnot). Thanks for any advice! My 2.5 year old has never been a stellar napper, but in the last week she has been up talking to herself for an hour instead of napping two days. It hasn't been a consistent nap time because of the time change and her not getting up at the same time every day. I know she needs a nap, but should I move it back? She gets up between 6:30-7:15, in bed at 7:15. I forgot, her naps have been between 12:30-1.